Noblesville West Middle School is located about 27 miles north of Indianapolis. "I heard gunshots and a few screams," a seventh-grader who was across the hall from the shooting told ABC News. "I was scared, I was in shock." The teacher and student victims were shot in that room, Jowitt said, adding that the situation was resolved quickly. The suspect, who wasn't injured and wasn't identified, was taken into custody, police said. 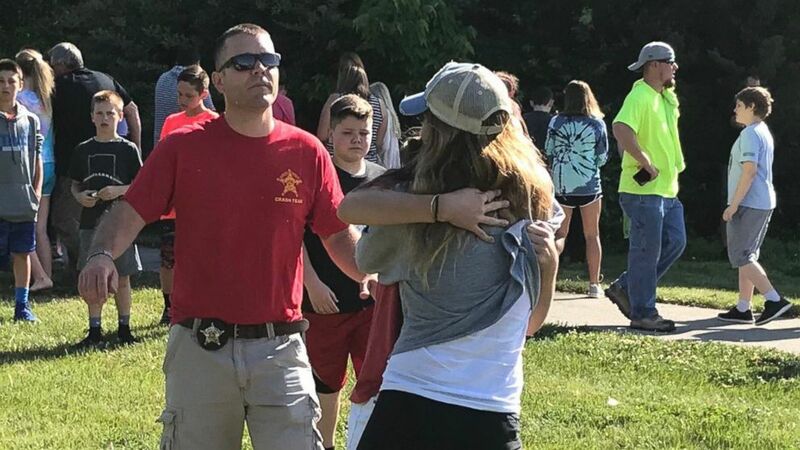 (Chris Sikich/IndyStar via USA Today Network) People hug after a shooting at Noblesville West Middle Scholl in Noblesville, Ind., May 25, 2018. 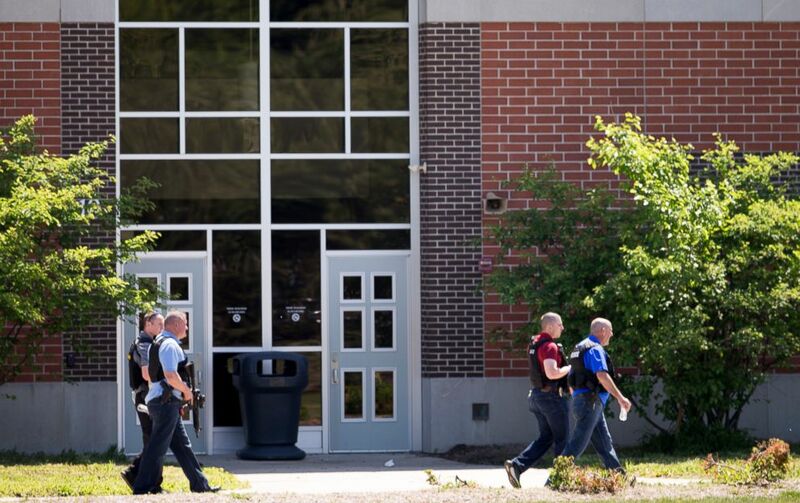 (Robert Scheer/IndyStar via USA Today Network) Law enforcement agents gather after a shooting at Noblesville West Middle Scholl in Noblesville, Ind., May 25, 2018. One student said he was in class taking a test when the suspect came in with a handgun and started shooting aimlessly, "waiving his hand around," reported ABC affiliate RTV in Indianapolis. The teacher -- whom multiple students identified as Jason Seaman -- allegedly stopped the shooter, the student told RTV. The family of Ella Whistler, the student injured in the shooting, released a statement Friday night saying her "status is critical" but she's "stable." "Our daughter, Ella Whistler, was involved in a horrific shooting today at her school. We will spend the next days and weeks processing what happened and why," the statement reads. "But first, we wanted to say she is doing well at Riley Hospital for Children. Her status is critical, yet we are pleased to report she is stable. We’d like to thank everyone across the country who prayed for our family today. We’ve felt those prayers and appreciate each of them. We’d also like to thank the first responders, Noblesville police, Indiana State Police and the medical staff and surgeons at Riley." 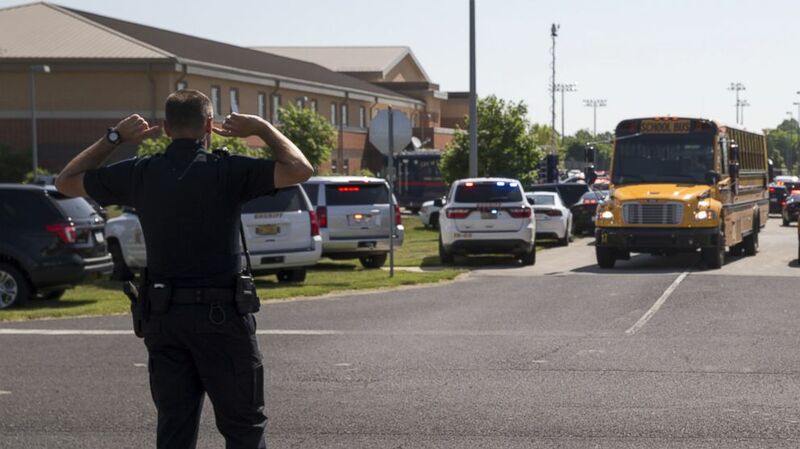 (Robert Scheer/IndyStar via USA Today Network) An officer directs traffic following a shooting at Noblesville West Middle School in Noblesville, Ind., May 25, 2018. Seaman was struck three times and underwent surgery, according to a Facebook post by his mother. By Saturday he had been discharged from Methodist Hospital in Indianapolis and was photographed at Noblesville West Middle School shaking hands with U.S. Rep. Susan W. Brooks. The local politician praised him for his bravery. “Jason Seaman selflessly put himself in harm’s way to protect his students and it is because of his heroic actions more students were not hurt," she said, according to a release. Seaman's wife, Colette, provided an initial statement to ABC News from Jason. "First of all, thank you to the first responders from Noblesville and Fishers for their immediate action and care," the statement from Jason said. "I want to let everyone know that I was injured but am doing great. To all the students, you are all wonderful and I thank you for your support. You are the reason I teach." Students were forced to shelter in classrooms and barricade doors during the incident. "I was thinking, 'It's not real, it's not real, everything is going to be OK,'" student Gabbie Manns told ABC News of her time barricaded in the classroom. "We are holding hands holding tight ... people I didn't even know that well came over and held my hand and we all felt really united at that moment." "There was people crying ... it was really chaos," she added. "I thought about all the other school shootings." 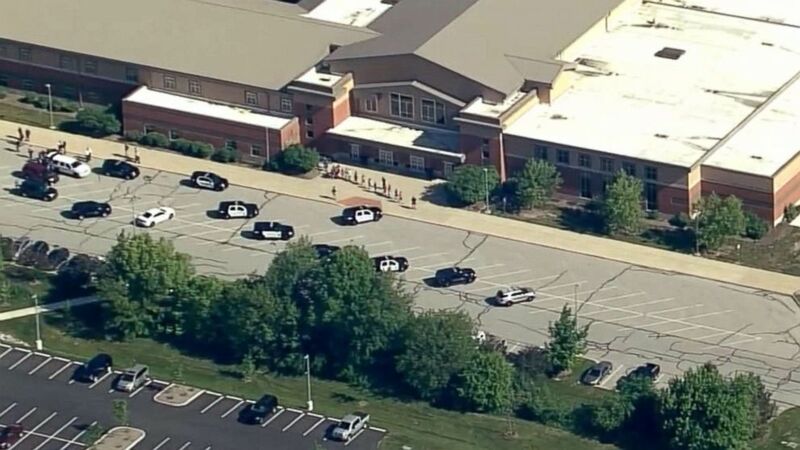 (WRTV) Students stream out of Noblesville West Middle School in Noblesville, Ind., after reports of a shooting, May 25, 2018. 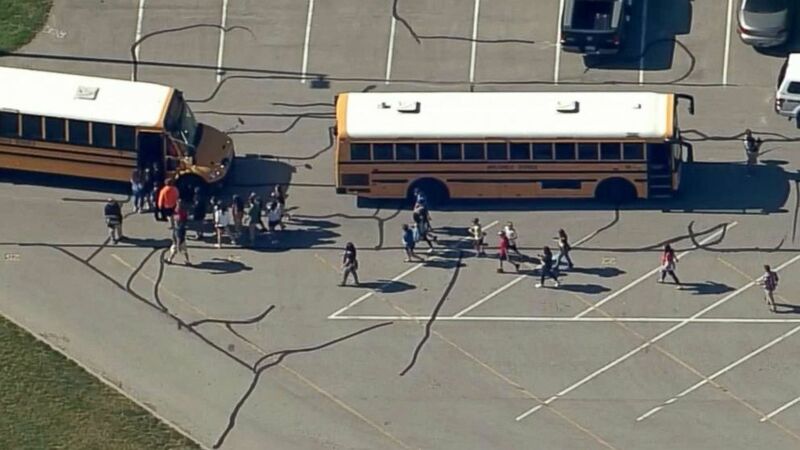 (WRTV) Students are loaded onto school buses at Noblesville West Middle School in Noblesville, Ind., after reports of a shooting, May 25, 2018. Tanner, an eighth grader, said he was in class when he saw kids running and screaming. “There was only three of us, we had to barricade the door to make sure no one came in,” he told ABC News. Kendall, a sixth grader, said she heard an announcement over the intercom, telling students to get in their rooms and barricade the door. She and her classmates got in the corner and the teacher turned off the lights. "I heard gunshots and a few screams," seventh-grader CJ Livingston, who was in a classroom across from the shooting, told ABC News. "We were all trying to be quiet and there were a lot of people crying around me." 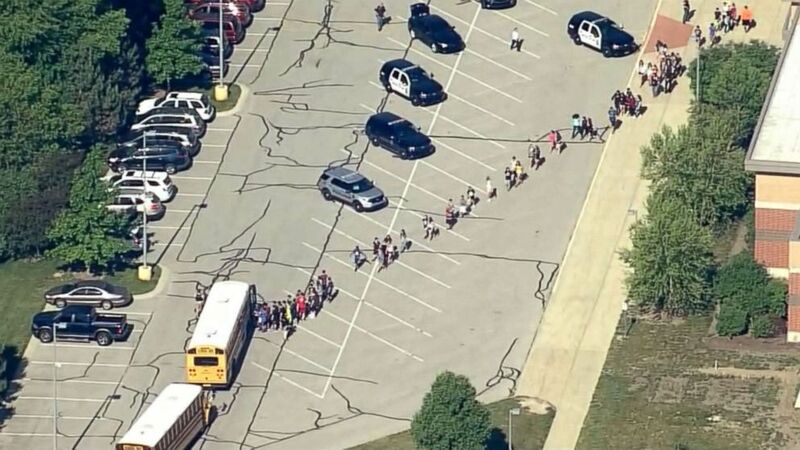 (WRTV) People stream out of Noblesville West Middle School in Noblesville, Ind., after reports of a shooting, May 25, 2018. "I was scared, I was in shock. I didn’t really know what to do," he continued. "I just thought I really needed to protect my peers and my friends and if something happened, I was petrified." He said they threw chairs at the door as a barricade and then lined up behind the desks to hide. "When I think about how that really must have felt for him I start sobbing," CJ's mother, Kristin Huber, told ABC News. "Something you don’t want your children to ever have to experience." "When you get a text message from your son saying, 'Mom, there’s an intruder, I just wanted to tell you I love you,' just thinking about him texting me that is pretty tough," she said. "It was devastating. I was grateful when he let me know he was OK."
The school has a full-time school resource officer who was in the building at the time, Jowitt said. The school does not have metal detectors, officials said. At the nearby Noblesville East Middle School, "everybody just got so scared" and a lot of people were crying, one sixth-grade girl told RTV. "It's a surreal feeling," the girl's dad added. "You don't think it's happening in your own town." "A secondary threat" was also made at Noblesville High School, Jowitt said. "We have not received any information that this has been anything other than a communicated threat," Jowitt said. "We are securing the high school and taking steps to make sure that it stays secure." "All this says to me is insanity has hit Indiana," one man whose wife's grandson attends school in the district told RTV. The man, who described the shooting as "chaos," said the boy texted his mother, "come get me." Vice President Mike Pence, an Indiana native, said he is "praying for the victims." Gov. Eric Holcomb said he was monitoring the shooting. "Our thoughts are with all those affected by this horrible situation,” Holcomb said. Speaker Bosma, Pro Tem Long & I are monitoring the situation at Noblesville West MS on plane to Indy from Europe. @indstatepolice are working with local responders & will offer all assistance needed. Our thoughts are with all those affected by this horrible situation. Friday morning's shooting comes one week after a teenage boy allegedly stormed his Texas high school, shooting and killing 10 and wounding 13 others. ABC News' Alex Perez, Andy Fies, Rachel Katz, Teri Whitcraft, Ryan Burrow, Briana Montalvo and M.L. Nestel contributed to this report.